ARIZONA’S MISDEMEANOR DUI PENALTIES AS OF 2017. Arizona has some of the harshest misdemeanor DUI laws in the country. There are, however, defenses and arguments that Tobin Law Office can raise in work for a dismissal, reduction, or acquittal. That’s because Tobin Law Office has the training, knowledge, and experience to fight for the best possible outcome in your DUI matter. Is my DUI a misdemeanor? If your DUI case is in either a Justice Court, City Court, or Municipal Court, then you’re only facing misdemeanor charges. If your case in Superior Court, you’re facing at least one felony. WHAT ARE THE MAXIMUM MISDEMEANOR DUI PENALTIES IN ARIZONA? Although a person can be convicted of several different DUI charges in one DUI case, the Judge can only impose one punishment for the most severe DUI charge. Over $10,000 in fines, surcharges, assessments, fees, jail costs, alcohol class tuition, interlock fees, and more. These are the maximum punishments allowed by Arizona law. Often times, Tobin Law Office can negotiate with the prosecutor, and make arguments to the Judge, to drastically reduce penalties. Tobin Law Office works hard to reduce and dismiss charges. And when necessary, we fight your case in front of jury. What are Other Penalties for a Misdemeanor DUI in Arizona? WHAT ARE THE MANDATORY MINIMUM PENALTIES UNDER ARIZONA MISDEMEANOR DUI LAW? Mandatory minimum penalties are those that a judge must impose if you’re found guilty in a plea bargain or trial. If you have a prior DUI that took place within seven years of the new DUI. The type of DUI charges you’re now facing. Keep in mind, these are the minimums. The prosecutor can seek, and the Judge can order, harsher penalties. Jail: Ten (10) days, but as little as one (1) day if you complete a drug/alcohol program. Money: Approximately $2,000 in fines, fees, and jail related costs. Counseling: Alcohol / Drug Screening and Classes. Driver’s License: Ninety (90) day license suspension (may be eligible for a work and school permit after thirty (30) days). Interlock Device: Six (6) months to one (1) year ignition interlock device. MVD License Points: Eight (8) points and Traffic Survival School. Jail: Thirty (30) days, but as little two (2) days if you qualify for home detention and install an ignition interlock device in your car for twelve (12) months. Money: Approximately $5,500 in fines, fees, and jail related costs. Counselling: Must complete a DUI Screening for a restricted license and to reinstate your license. Counseling hours are not mandated by the extreme DUI statute. Interlock Device: One (1) year ignition interlock device. Jail: Forty-five (45) days, but as little as three (3) days if you qualify for home detention and have an ignition interlock in your car for twelve (12) months. Money: Approximately $7,500 in fines, fees, and jail related costs. Interlock Device: Eighteen (18) months ignition interlock device. MVD Points: Eight (8) points and Traffic Survival School. Interlock Device: As of January 1, 2017, there’s no interlock requirement, but a judge has discretion to add it on. MVD Points: 8 points and Traffic Survival School. If you have a DUI conviction for an incident that took place within seven years of the new DUI offense date, you may face the following enhanced minimum penalties under Arizona’s DUI law. Jail: Nine (90) days, but as little as six (6) days if you qualify for home detention and complete a drug/alcohol program. You may be eligible for work release after forty-eight (48) hours in custody. Money: Approximately $5,000 in fines, fees, and jail related costs. Driver’s License: One (1) year license revocation. You may be eligible for a Special Ignition Interlock Restricted License after the first forty-five (45) days of the revocation period. Interlock Device: After revocation period, you can reinstate with an additional (1) year with an ignition interlock device. MVD Points: 8 points to MVD Record and Traffic Survival School. Community Service: Thirty (30) hours community service. Jail: One hundred-twenty (120) days, but as little as twenty-four (24) days if you qualify for home detention. You may be eligible for work release after forty-eight (48) hours in custody. Money: Approximately $9,000 in fines, fees, and jail related costs. Interlock Device: After revocation period, you can reinstate with an additional one (1) year with an ignition interlock device. MVD Points: Eight (8) points to MVD Record and Traffic Survival School. A.R.S. § 28-1382 Super Extreme DUI with a Prior DUI Conviction in the Last 7 Years. Jail: One hundred-eighty (180) days jail, but as little as 36 days jail if you qualify for home detention. You may be eligible for work release after forty-eight (48) hours in custody. Money: Approximately $12,000 in fines, fees, and jail related costs. Interlock Device: After revocation period, you can reinstate with an additional two (2) years with an ignition interlock device. A.R.S. § 28-1381 (A)(3) DUI Drugs (Marijuana, Prescription, and Illegal Drugs) with a Prior DUI Conviction in the Last 7 Years. Driver’s License: One (1) year license revocation. You may be eligible for a Special Ignition Interlock Restricted License (SIIRDL) after the first forty-five (45) days of the revocation period. What circumstances does the prosecutor and Judge consider in a DUI plea bargain or sentencing? You driving record and criminal history. You BAC and the signs of impairment. Your behavior at the time of the alleged DUI. Whether the DUI caused an accident, injury, or property damage. If there was an accident or injury, the Court will consider any victim input. Your personal circumstances, background, and history. Now that you know the minimum penalties for Arizona misdemeanor DUI’s, it’s important to keep in mind that you don’t receive the minimum penalties simply because you were charged with DUI. Tobin Law Office can ensure that every available defense is raised and that every legal avenue is explored to dismiss or reduce charges, limit penalties, and protect your rights. 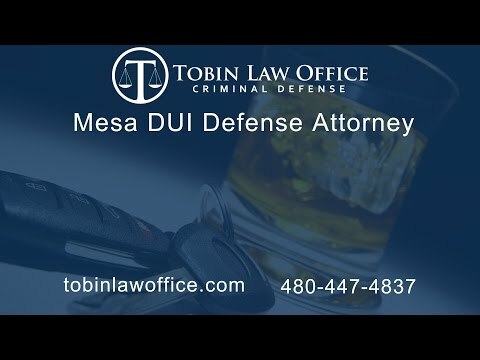 If you’re facing an Arizona misdemeanor DUI in a justice court, city court, or municipal court, call Tobin Law Office at 480-447-4837 to learn about your rights and what can be done to protect your future.